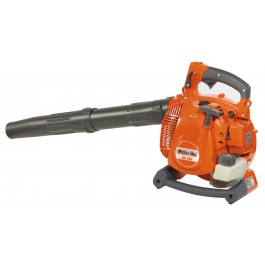 Practical hand held blower ideal for tidying away leaves, green waste and other debris in the garden. Characterised by low vibration for consistently comfortable and extremely quiet operation making them ideal for use in built up residential areas. Eco-friendly engine (complying with euro 2 emission standards) characterised by low noise, ideal for use in built up residential areas. Offers the lowest vibration levels on the market; only 3.5 m/s2 aswell as extremely reduced noise emissions of only 89dB (A). "Vibcut" professional anti-vibration system, utilising mounts with 4 steel springs located between the engine and the outer casing, ensuring that vibrations transmitted to the operator are significantly reduced. Rubber covered handle ensures a firm and comfortable grip on the machine, while at the same time isolating the hands of the operator from vibrations. Vacuumed materials is chopped up by a rotor with 4 steel blades (standard feature) to reduce the volume when inside the bag, so that more work can be done with fewer emptying stops. Cloth filter ensures maximum protection for the engine, in the event of operation in dust laden environments. Reusable and easy to clean. The blower can be converted to operate as a vacuum cleaner by fitting a kit comprising hose and collection bag (optional).